Cheshire Car trim have the necessary skills to work on any re-trim interior upholstery aspects of your vehicle such as car seats, door panels and roof lining. 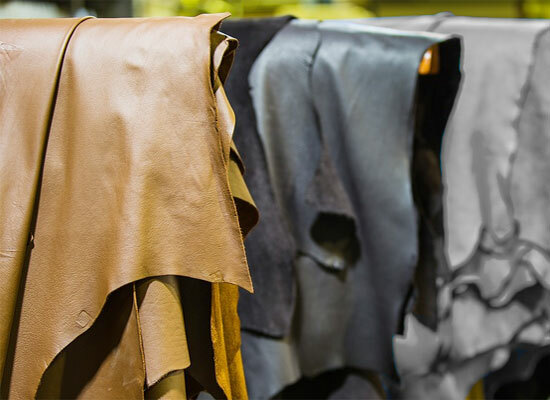 Whether you require an upgrade from fabric to leather or a just fancy a change in colour, we can perform a complete or partial interior leather retrim. We can also add in things like diamond stitching and embroidery which will greatly enhance the look and feel of your vehicle. We have a variety of automotive leather suppliers and we can match all manufacturer’s leather seat covers and interior panels. 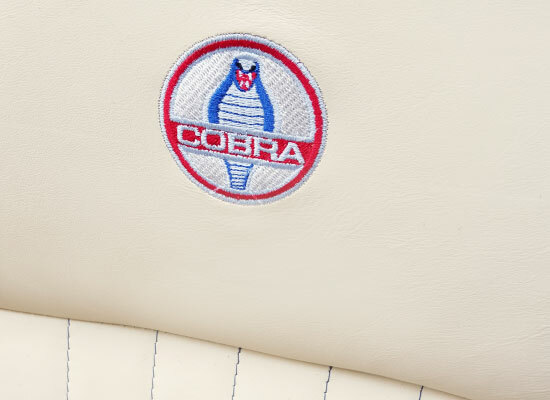 If a leather upgrade is required, we can advise on suitable leathers to compliment your vehicle. At our workshop in Macclesfield, we have a number of sample leather books which we can guide you through and assist with your selections. We work on interiors for all car manufacturers from budget cars to more expensive luxury cars and we aim to offer the best solution for your budget. 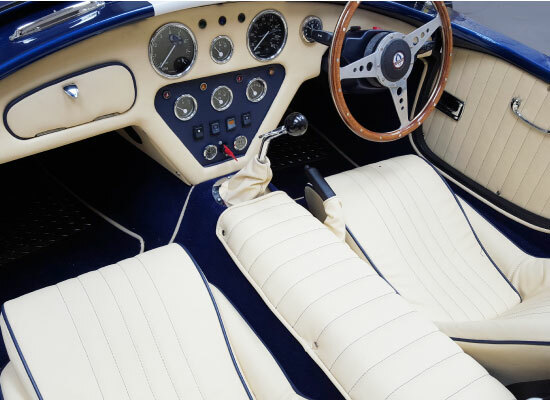 If you are working on a classic car restoration, we can help by replacing all interior retrim aspects of your vehicle. This includes seating, headrests, door panels, dashboard, carpets and headlining. 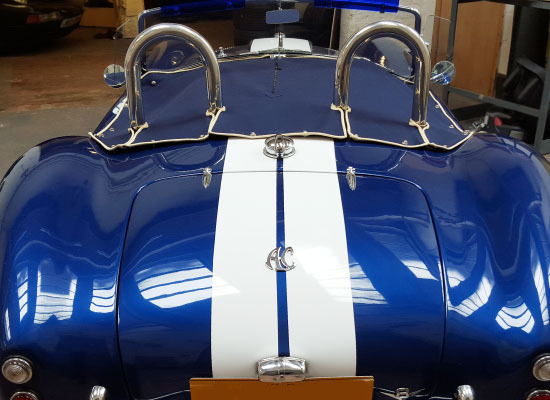 The example shown in the slideshow is a classic AC Cobra which has been fully restored. 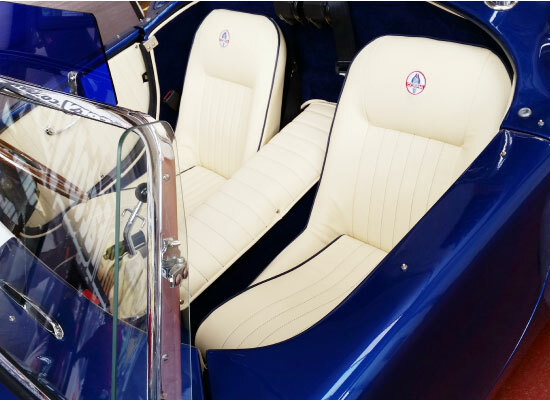 Once restoration work had been completed on the outside, the vehicle was handed over to us at Cheshire Car Trim to finish the project on the inside. After initial discussions with the customer, we then set out to select a suitable leather for the vehicle. We then stripped the vehicle down, carefully removing seats, door panels and dashboard elements then set to work. 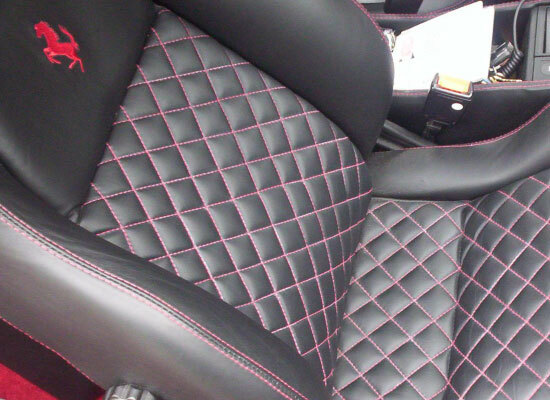 The seats were also finished off with embroidery in the headrests and a vehicle tonneau cover was specially made. As you can see, the results of the whole project were fantastic and the customer was delighted with the finished vehicle. 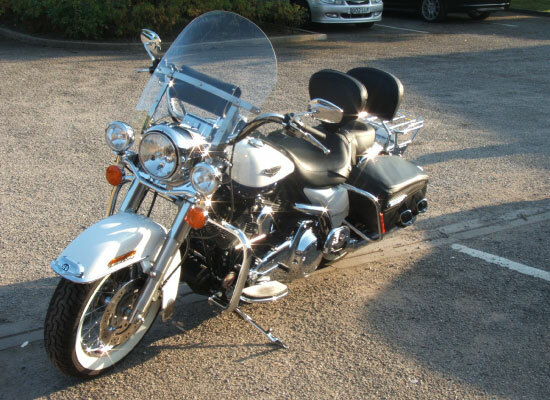 We can match most motorcycle original seat covers or create a bespoke look for your bike. Please ask for details. We have a selection of leathers that we stock in-house which we can sell direct to you for use in your own project. In the unfortunate event that you have an accident and your airbag has been deployed, we can replace the airbag at the same time as any repairs to your car upholstery. Similarly if for some reason your airbag has simply malfunctioned, we can take care of this too. We also have diagnostic equipment which will show up any fault codes with the airbag. Depending on your vehicle model, airbags are located in a number of places in your vehicle. These can include; in the steering wheel; passenger seat dashboard; glove compartment; seat sides; interior door panels; headlining. We can repair a deployed airbag in any of these areas. For Car, Van, Campervan, Motorbike or any other vehicle interior leather re-trim projects – contact Cheshire Car Trim now!